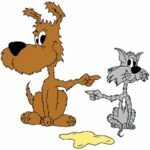 Boise Pet Odor Removal and Pet Urine Elimination. 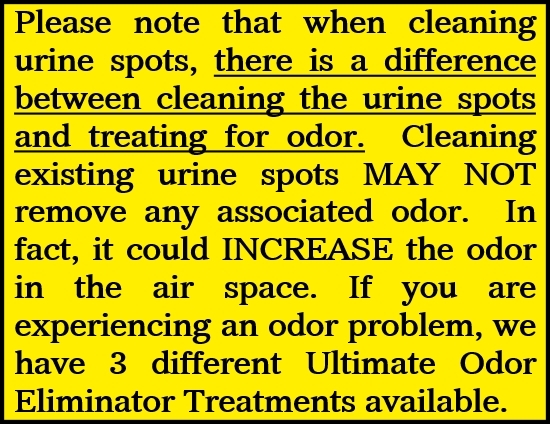 Odor Remediation that is GUARANTEED! The elimination and control of odors, truly separates the amateurs from the educated professionals. At Ultimate Carpet Cleaning, our technicians have completed training and formal written examination for odor treatment, not to mention, extensive field experience with some of the most putrid odors we could find for them. The majority of odor problems in our homes are caused by our furry family members. It’s perhaps this cuddly, furriness that allows our pets to remain in our homes, after all, we would probably relegate one of our extended family members to the garage, if they boldly behaved the way our pets sometimes do. For this reason, the sell of over-the-counter, topical, odor neutralizers, urine spot removers, and deodorizers is a multi-million dollar business. The problem is that most of these products never get to the odor source and even if they do, would be at best, a perfume to cover up smells. Even worse, many of the most popular brands can damage the texture, dye structure, and/or leave behind tacky residue that attracts soils and damages fibers. However, you can’t allow a pet accident to remain in your floors or fabric either. 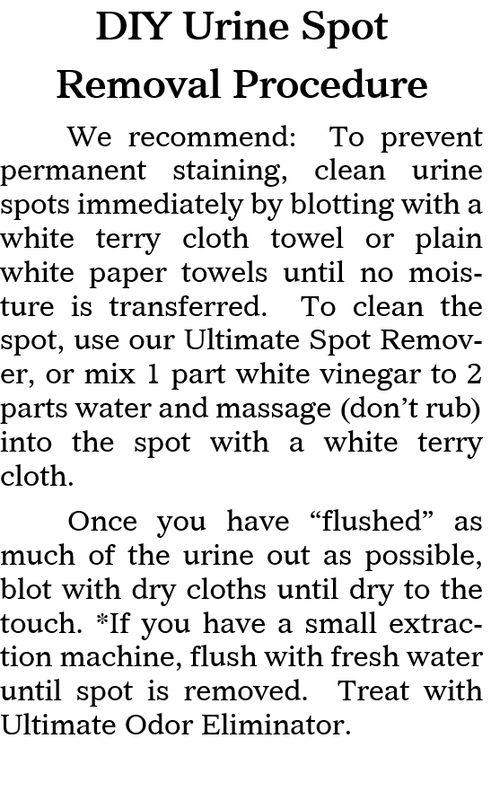 Once it dries, it becomes much more difficult to remove. It can easily cause its’ own permanent damage if left for days or weeks. You don’t have to waste your money on fresh pet accidents. When urine is first deposited, it is in a slightly acidic state and is therefore easily removed. Book a FREE Pet Odor Remediation Appointment by clicking on the BOOK NOW above or call our office at 208.336.9858. 1.) Minor Odor Treatment: A cost effective service for minor odors. We inspect and identify the odor source(s). We, then, apply a professional strength enzyme, specially formulated for to be safe for your family and people with chemical sensitivities. (If you can smell the odor when you walk into the room, this is not minor odor. Minor odor can only be smelled within a few inches of the odor source or on a humid day. 2.) Moderate Odor Treatment: After identifying the odor source, we saturate the carpet and carpet cushion, clear down to the subfloor with a special oxidizing deodorizer. We use our “water claw” sub-surface extraction tool to remove the solution and odor from the subfloor, up through the carpet cushion, through the carpet and out to our truck. This process can cure many odor problems as long as the solution comes in contact with the odor source.